Pagan holy days are based on the annual progression of the earth around the sun, and the cycle of the seasons. 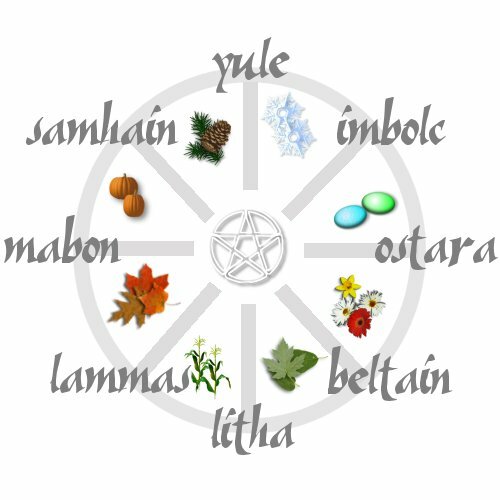 Because Pagans see time as an unending circle rather than as a linear progression, our calendar of holy days is laid out on the eight-spoked 'Wheel of the Year.' Pagans celebrate the Solstices and Equinoxes and the four old European 'cross-quarters' that fall in between them. Most Pagans also regard each holy day as being associated with a particular life phase of the God and Goddess. Yule, the Winter Solstice, falls on or around the 21 of December. It is the longest night of the year; it marks the (re)birth of the God and the promise He brings of a new year. Imbolc is the first holiday of the Gregorian calendar year, falling on February 2. It is a festival of light, welcoming the lengthening of the days and the rising strength of the young God. Ostara, the Spring Equinox, falls on or about March 21. The hours of day and night are equal; light is about to overtake darkness. The Goddess and the now-grown God awaken with Their Earth in the joy of springtime and of new beginnings. Beltain, on May 1, is a celebration of fertility -- both of the Earth and of the betrothed Goddess and God, who consummate Their union. Litha, the Summer Solstice, falls on or about June 21. It is the longest day of the year. Life on Earth is abundant; the Goddess is carrying the child of the God conceived at Beltane. Lammas, on August 1, is the festival of the first harvest. But on this day the power of the God begins to wane as well. Mabon, the Autumn Equinox, falls on or about September 21. Again the hours of day and night are equal, but now darkness will begin to envelop the light. The God pours out the last of His strength as the harvest begun at Lammas is completed. Samhain, on October 31, marks the death of the God. It is the point of the year where the veil between the Worlds of Form and Spirit is thinnest, and Pagans honor loved ones who have passed away. The Earth and the Goddess settle in for the long night which will end at Yule with the birth of the God. Most Pagans also mark in some way the phases of the Moon, with many conducting rituals at the Full and New Moons.